Nature inspires me, so this SOA box is a must have! Thanks for sharing your inspiration! Travel inspires me! Thanks for sharing your talent! For some reason,not getting your pictures! 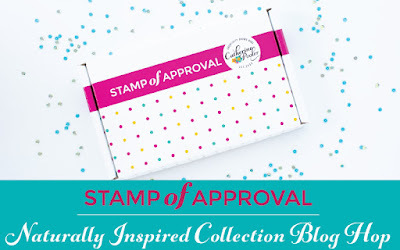 Not sure what your cards look like, but I bet they are as fantastic as the rest of the blog hop participants Kimberly! NO pictures here either :(. Not getting your pictures, but will check back. I'm sure they will be just as amazing as the other cards on the blog hop. I wish I could see your creations, but the images aren't loading for me. I will try back later and see if it's been corrected. People inspire me and I've been so inspired by all the creativity of this blog hop. The SOA collection is wonderful and you have all shown that! I'll stop back later, hopefully the pics will be there. Can't wait to see what you have made. I also couldn't see the images. Must be a glitch. I'll try back later as well!! I'm sure they're awesome! I couldn't get the photos to load either. I will definitely be trying again later. Looking forward to seeing what you chose to create. Love this kit and I'm sure whatever you made is fabulous! Your photos are not loading! I'm not seeing the photos--others have said the same thing. I would really love to see them, because I'm loving the inks and stamps that have been shown. Cannot comment on what I cannot see but I'm sure the work is wonderful since the raw materials from CP's SOA box are awesome! I hope the pictures get fixed soon. Would love to see your work. Yes, unfortunately your photos are not showing up, but I'm certain they're beautiful. I'm inspired by Jay about everything around me, from my bathroom shower curtain, someone's card, nature or the design of a beautiful wine glass. Its amazing where inspiration can come from! I'm sorry I can't see the photos, but I'll stop back later. Still excited about the release! No photos for me either. I hope I remember to come back and see if I can see them later! Ok for some reason I don't see your photos, and I was not able to comment on the blog before you. Im sure your cards are amazing. Sorry, but your pictures aren't coming through. Would love to see your creative ideas. These stamp sets are amazing with Catherine's inks! Can't see your images, I will check back and take a look later and hopefully you can fix the problem. Thanks for sharing. Unfortunately your pictures aren't showing. I would love to see them. Hopefully this problem will be fixed. I sure wish I could see your designs, I will return and hopefully see what I anticipate to be terrific ideas. I am inspired by the beauty and the many colors of nature. I am also inspired by the work of all the artistic people who so graciously share their ideas with all of us. Oh no I can't see what you made. Anyway I am inspired by all the sacrifices about troops make for us. I would love to see your cards but something is wrong! Gosh thought it was my computer but guess not, I can't see your pictures either however I bet your cards are wonderful. Will checkback a little later to see if the pictures show up. Couldn't see the photos but will check again later! I'm sure they are fantastic designs! Would love to see your creations and be inspired, however, the pictures are not showing up. I couldn't see the pictures either.....I'm sure they are beautiful and hope we can see them soon. Disappointed that I can't view your cards, but I will try again later. I don't know that I can pinpoint one specific thing that inspires me. It all depends on where I am and what I am viewing at the time. Alot of times it is the creativity of others. Hope the picture links are soon fixed. Would like to see your bold color inspirations. Other crafters inspire me. I wish I could see the pictures! I would've loved to have seen what you made. I'll check back in a bit. I'm always inspired by other card makers, as well as by things in nature...flowers, birds. Darn. The photos did not load. No photos showing....but I bet they are beautiful cards! I would love to see your cards but there's no pics. Sorry. Let me know when they are up so I can revisit please. I don't want to miss a thing. I will stop back later to see if your pictures are up. Thank you for sharing your passion. Wow I guess everyone was up too early :-) I can see your cards. They are incredible. Love the use of the feathers and medallion mix up. Your sunset cards is beautiful on top of the die cut. I especially love your silhouette card. I'm looking forward to using the treasures in this set. I'm already starting some watercolor backgrounds to use when the stamps get here!! Love the cards and this entire collection! Your cards are awesome. I'm loving this blog hop seeing all the wonderful DT creations. This just might be the best SOA collection yet. Beautiful cards! This is an amazing box of supplies!! I love the second one! Breath-taking! Love the bright colors that you've used! Thanks for sharing! Your cards are very pretty. Someone lucky will receive one in the mail. My inspiration is florals I love the colors, the shapes and the scents. In addition I love birds of all kind. I hang a feeder on the back deck and all varieties come to it. They eat and sing to me. Love how you mixed everything together on the first card. Beautiful cards. I love these cards. That orange one is just super. SOO pretty! Thank you for sharing! Such bold creations! The collage on your first card is awesome--so many fun elements; the overall effect reminds me of a dream-catcher. Your second card with the black silhouettes is reminiscent of some "out-of-Africa" cards I have seen recently. Intense, sunny colours with striking images over top. I love the white-on-white mat you created with the lattice die. Thanks for the inspiration! Nature is what inspires me. I love the card with the die cut in the background. The colors are incredible because you've used CP inks!!! Beautiful! Thanks for sharing your ideas. Beautiful cards! I especially love the silhouette on the love card. Gorgeous! I love the first card! Love how you mixed the feathers and medallions! Gorgeous cards! I love the second one so beautiful and bright! Yay! Glad I stopped back to see your cards. Thanks for sharing! Great cards. My favorite is the second one. That bright background is outstanding and the use of the lattice die is perfect. Cant wait to get mine. Awesome job, love to see what everyone comes up with! The colors are bright and warm. and tree makes them really pop. see on the blogs I visit. Beautiful! Everything in nature inspires me. Creative people inspire me! There are times when I am stuck and by looking at what other people have created helps me get going again. Thanks for sharing your beautiful creations. Work like yours inspires me. Although I hesitate to use a lot of bold colors, I do love the way you used them. Great cards, I especially like the orange shadow one. Thanks for sharing. Your cards a rich in color, and beautiful. I really liked the way you used the medallion for the sun in the background, which makes the feathers pop out in front. Thank you so much for your BEAUTIFUL cards. I really do think, this SOA is the best one, because nature is beauty, and that was captured in you cards. Bright colors inspire me too. Your cards will inspire as well. Great job... they are beautiful! Thank you for sharing! Such beautiful cards! I like that you used some images I haven't seen on any other card so far, and your color choices are fantastic. Color is what inspires me the most! Love you cards, especially the first one with the feathers. The focal point is striking! Thank you. Kimberley - love your postcard styled card. Beautiful colours and layers. Lovely. Thanks for the inspiration! Gorgeous cards, Kim. Love the bold, rich colors. Your cards are one source of inspiration. Love the vibrant colours of your second card, Kimberly! I am inspired by many things, ranging from a pattern in a magazine in the waiting room of my physiotherapist (I created a card after that) or challenges that motivate me to venture out of my comfort zone. I am inspired by color and beauty. Fresh flowers inspire me with their shape and color hues. I just love to be creative! Gorgeous Colors. I really adore that second card with the lattice die & the birds. I love those Catherine Pooler inks. They are so vivid & easy to use. I can't wait for the release. I love everything in the SOA collection and can't wait to purchase one. Your cards are beautiful! My mom inspires me. beautiful cards! I really like the second one and how you put the lattice die in the background! Nature inspires me. Cute cards, so excited about this collection. I love the way you have combined the blues to get a new color. Everyone is so creative. Oh wow, lots of fun here! I am a sucker for sunset colours and silhouettes. Beautiful cards. So vibrant! Beautiful designs. I love your take on this fabulous collection. I can't wait to get my hands on these goodies. Such colourful cards & I love the background on the second one. It reminds me of a sunset & I find nature to be most inspiring for me. Great cards Jill. The brilliant colours are terrific. I love the bright colors and contrast! Thanks for sharing your inspiration! Definitely all the amazing social media artists give me a ton of inspiration!! Your cards are awesome!! Beautiful cards! I am inspired lately by the things growing around our small farm. so happy to see your cards with these stamps! Love the last one! Your cards are beautiful. Nature is so inspiring. Your cards are simply gorgeous. I really like the simplicity of the last card and how you used that lattice die. Nature's colors inspire me, especially all the beautiful colors of flowers and birds. Job well done! Gorgeous cards, love the sunset one! Great cards thanks for sharing your creations!! I am inspired by the different colors of the ocean waves and colors of the forest. Very pretty! Color really inspires me--I love to look at rainbows in the field near my house and colors in the sunset. Thanks so much for sharing! Wonderful use of color on both cards. I'm always inspired by nature. Gorgeous cards! Nature inspires me. Gorgeous cards, love your CAS designs and the bright CP ink colors! I get inspired by a walk through the woods or a garden. This blog hop khas been my inspiration! Beautiful cards especially your sunset card. 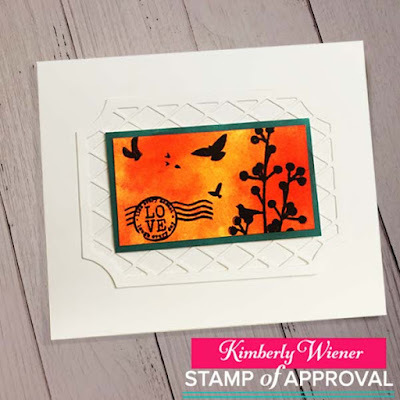 Love your use of the love stamp as well as the colors! How I love the sunset card! It is so realistic. I like the lattice behind the sunset and birds. Nice work on both cards. Love your cards especially the one with the layers and postage stamp. Color is so vibrant!! Catherine's inks and these stamps are producing absolutely gorgeous cards. Your love of colour definitely shows. The sunset you created on the one card is amazing. Beautiful cards Kimberly! Thanks for sharing! My 7 month old is my greatest inspiration! He has so much spark and personality already and makes me want to be the best I can be. I love the card with the postage look. The colors are so vivid! I really love your 2nd card. The black images on the sunset background. Great card to CASE. I'm a fool for Ink blending. Both of your cards are awesome, but that second one… I love it. Love to work with the Catherine Pooler inks and stamp sets! I love the colors on both cards but I just love those feathers. They are so beautiful no matter how they are colored. However, I have always liked black plants on the sunset background. Love anything with sunset colors, and your card is amazing! Love it on top of the lattice work die-cut. Great cards! I am inspired by patterns and color combinations in nature so this box is awesome! Love the colors, very inspiring. LOVE your cards!! I often look to nature for inspiration - the colors, the patterns, the movement of nature - love it all. That 2nd card ROCKS. Rainbows make me want to duplicate them! I especially love the layout and gorgeous colors of your second card! Sunrises inspire me! Your colors are glorious. Love them. Hi, I like how you did the Love stamp. Bright colors!!. Thank you for sharing. What great BOLD colors! I also love your use of white with the sunset colors! I love how you used such bold colors. Great inspiration. Love the interaction of dies and stamps . Bright and bold! I'm so glad you were able to get your images working again. I stopped by this morning, but they weren't showing. I'm glad I came back to see them! They are great! I love how you did the darker feathers on your 1st card. I'm inspired by all of these ideas and can't wait to try them out when I get my SOA! Love the use of the bright colors and how you incorporated them in both of your cards! Thanks for sharing your talent! Unique and interesting, I loved looking at the repeatedly- thank you for inspiring my thoughts today! Love the bold, bright colours, TFS! These cards and colors are so inspirational! They make me so happy! LOL! Great colors and design. I am inspired by the colors and patterns in nature. beautiful cards , I love these bright inks!!! I can see the pictures & am so glad as the cards are awesome! I'm totally inspired by the fabulous design ideas & those gorgeous bright colors. I can see I need to invest in some of Catherine's inks. Nature inspires me. Love florals. Your cards are pretty. Really great design! You make it look so easy. Great cards! Thx for sharing. Hi, beautiful and vibrant colors, I believe a lot of people are inspired by nature wich is a beautiful thing !!! I'm loving the color pairings you chose! superrich and vibrant! 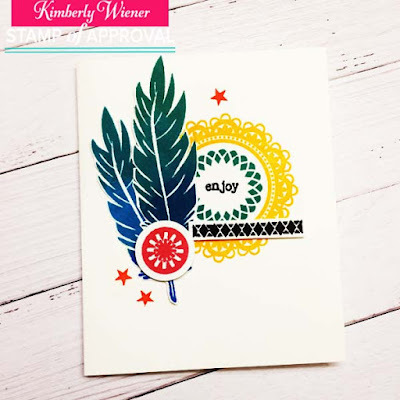 Love the card using birds of a feather stamp. Pretty cards. Can't wait until this box goes on sale. Super cards!!! I love the second card with the die cut background and the fantastic sunset coloring! Thanks for sharing! Thank you for sharing the inspiration. Great products. fabulous cards. I'm often inspired by nature, particularly flowers. I would love to win these amazing stamps-I absolutely love the cards you made with them! I am inspired so much by the world around me and the magical creatures that could be living in it and we just can't see them. I love taking Fairy Tales and making them come alive! Thank you so much for the opportunity to win these beautiful stamps! Your sunset card with the birds, flower, and the lattice die cut is my favorite as I am inspired by sunsets/sunrises in nature, and yellows and oranges are my favorite colors! Just gorgeous! Love the combination of feathers and medallion stamps. So many uses for this collection. Thanks for sharing, it is inspiring! And the second card ..... love it all! Wonderful blending of colors for sunset that gives great background for garden images. And the lattice work, love it's use!! Really beautiful cards from an amazing release! Very inspiring! Thank you for sharing, your cards are beautiful! Beautiful work...am sure the SPA box is a bug inspiration in itself ! Such beautiful cards! I am inspired by nature- such gorgeous colors when you take time to look. WOW!! I really love your cards and I think your second is especially very special!! What inspires me is watching my grandchildren play and seeing what the other bloggers are doing, then there is all the flowers I have out in my backyard and at my daughter's house next door! Just all the colors gets me really excited and makes me want to run into my greenroom and get inky!!!! Nature inspires me every day. The colors I see every day amaze me. Thanks for sharing your great cards! I love the colors in your feathers in the first card. Gorgeous! Great cards and your choice of colors gave a whole new look to the stamp sets! Wow! Your cards make such an impact! Definitely frame worthy! Love how deep the colors are on your cards, very nice!!!! Love color and I like that you used the different elements in your cards. The combination of the inks, stamps and dies was awesome!! Wonderful cards, Kimberly. Anything in nature inspires me so this set is for me. Your cards are so different from everyone else...love your unique style...great use of colors! Thanks for the inspiration! I'm inspired by stampers such as yourself. I love watching videos and blog hops to get new ideas for my artwork. What great card and color ideas. I came back today to see if I could see your cards and I can! YAY!! I love the postcard one. The colors are amazing!